I have had several people ask about piano tuning and I wanted to make a couple of comments to help people understand what this is all about. Tuning simply brings each of the strings to the right tension point in order to make the correct sound when struck by the hammer. The piano has an average of 215 to 250 strings depending on the scale design of the manufacturer. Each of these strings has to be touched or at the very least addressed by the tuner when he is in the tuning process. 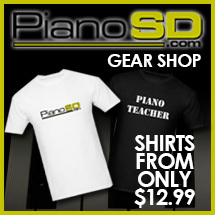 At PianoSD we use Accutone Piano Tuning almost exclusively http://pianoservsd.com/ . Although we have many friends who are tuners in the area, Paul McCloud is on staff here at PianoSD.com in Mission Valley, San Diego, Ca. During the tuning process and having to check that the hammers are at the right distance from the strings, the hammer strikes at the right spot on the strings, the tone, etc. can take some time. It would not be uncommon for a tuner to spend 2 to 3 hours tuning an average piano. Although the climate, humdity, the time spent playing, etc. can have an affect on the sound, your piano should be tuned every six months. Even if the piano is in near perfect conditions 24/7 365 days a year, the piano should never go longer than 9 – 12 months at the very most between tunings. The up keep on the piano is not expensive in contrast to the enjoyment or value of the instrument. Most tuners charge between $100.00 to $125.00 to tune. You should ask if they are members of the Piano Technicians Guild. You can find these technicians at www.PTG.org and simply do a search for your area. PianoSD.com offers tuning and moving services as well as many other piano services and would be glad to help recommend someone in your area. If you need assistance with tuning or any other service please contact us here at PianoSD. 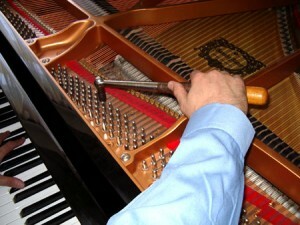 Piano tuning is as important to the life of your piano as regular maintenance is to the life and health of your car. However, please remember the piano will last longer, maintain its value longer and be in your family longer than any car you will ever own. Drop by and see us sometime, we would love to meet you.